NEXCOM HMI eLITE610 embodies a high performance real-time control and monitoring solution for factory automation. 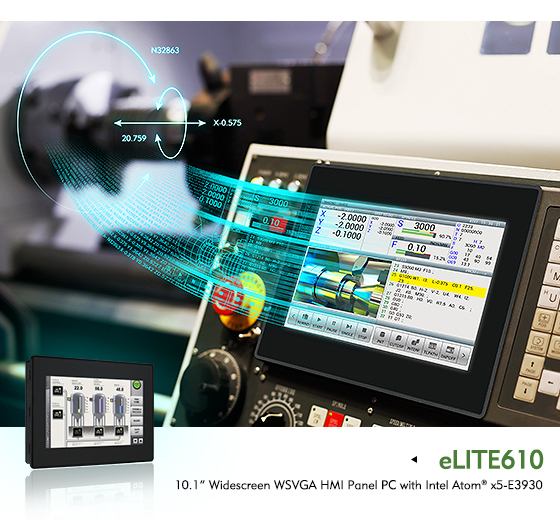 Capable to deliver enhanced 2D and 3D graphics in high resolution, the eLITE610 comes with the HMI software JMobile Studio to simplify design and development. This HMI solution provides a flexible and more intuitive user experience for operators, allowing control, monitoring and visualization of machine processes to ensure data acquisition for optimal operations. The eLITE610 enables real-time machine control in a myriad of factory processes with a clear visualization through multiple communication protocol support. Monitoring becomes clearer and smoother through high resolution graphics. To ensure durability, the slim design withstands tough industrial environments while providing a comprehensive solution in conjunction with the JMobile Studio software across various industries. In metals manufacturing, functions such as cutting, bending, and folding can be executed seamlessly with the eLITE610, as well as the speed of each process. Water distribution and waste water treatment require HMIs to set the open/closed state of valves, and bottling processes also apply this technology to control different stages in the production lines to sharpen error detection and correction. Manufactures from automotive, food and beverages industries can rely on this high-end HMI solution to display variables that need meticulous care, like temperature and pressure. Attention to detail is required in production of canned foods, beer brewing, and car painting chambers, applications where consistency ensures quality, taste and excellence. In order to fulfill different HMI requirements, the eLITE610 solution permits a versatile design of features with JMobile Studio. A large drag-and-drop library of templates, widgets and symbols is used to create full scalable vector graphics in the editor. Once the HMI is completed, the acquired data is processed and displayed as 2D and 3D animations accordingly. Various processes can be visualized through their different stages, like the several phases of injection molding, from clamping to injection, even dwelling and cooling. Moreover, the HMI solution can run in client-server mode allowing remote access for further convenience.